Q. Where can I find academic material for my assignment? A broad interdisciplinary search tool like the Library's Discovery search tool (the default search box on the Library's homepage) or Google Scholar is probably the best place to start your search. These tools will lead you to a variety of different academic sources and will help you broadly explore your topic area. Both Discovery and Google Scholar support natural language searches. Often, a simple natural language search is the best place to start. For information on the search features of Google scholar check out our library guide. 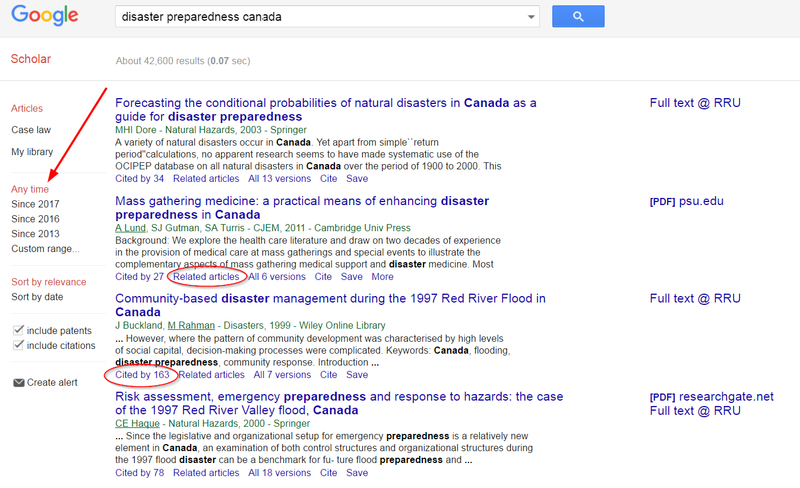 Use the “related articles” and “cited by” features to explore resources related to pertinent articles. Use the date range to limit your search to a particular time period. Go beyond the first page of results. Google Scholar covers a huge range of material and the best sources won't necessarily be on page one. Check out the results on at least the first five pages. More information on Discovery and how it works is available here: http://library.royalroads.ca/what-discovery. Use the save function on the right hand side of the screen to save articles into a list you can consult at the end of your session(click on my list to access the articles). To save your list permanently beyond your current session, use the sign in button to log in to your account before you start searching.